Meanderings and Reflections: LaBels limit me but save time! Really interesting post. I think labels can serve a purpose in categorizing and understanding situations and people but we should not be limited to them. Words are confining and should never limit the ever changing reality of the individual. Loved the t-shirt! I think it is a natural tendency to label just to keep order in chaos. However, as you point out, the danger comes when that label sticks and inhibits growth. First I thought of Popeye whose "I yam who I yam" was popular years ago. Then it occurred to me that would be a 'label' for 'someone who is interested in Popeye...hmmmm, what to do? What about those (us) who just wanna be ME today, and possibly another 'me' tomorrow? Ya know...I could write a dissertation on this topic. labels reduce the pain one will have to put to thinking or probably they simply destroy our creativity.... but they also work in a way as the red colour signifies danger - they make it quicker for us to understand and remember things. So, it's good - care should only be taken to stop excess usage - as that destroys its significance. Labels allows the mind to put things into perspective... helps restore a sense of balance or closure. There are times when one cannot put a name to an action, emotion or words.... and it is at this point when one needs to just be.... hence no label needed. So I believe it up to the individual to decide! Seems like we spend our lives trying to summerize other peoples history (and our own) into an easy to understand word. Once one comes to that conclusion, out comes the label that one can now apply to "that person" each time the topic of "that person" comes up. I like to believe that we each form our own story as a result of society. The people we come into contact with help form us, shape us, and label us. We come to believe in the truth of that story that was made for us and by us. Changing my own story was and is difficult. Coming to realize that there were different truths that could be applied to my story was life changing. I could get away from my lables and start fresh, breaking down the walls I had built to protect myself. Others still use the old labels when they think of me. Nothing I can do about that. People always judge. I try hard not to use predefined lables when dealing with others. When I listen to their stories without judging or trying to label something magic happens. I get to meet another human. we resort to labels because our brains do not have the ability to fathom the vast amount of information - in the form of people, choices everything - and so we classify them - which is a great limitation but helps us to cope with life! Hmmm....that Brian Miller is a wise one. I think I will have to go read what he has to say. Good post...we do put labels on others. I think I notice it most when others put a label on me. Unfortunately people do tend to label everything. It makes them feel safe an puts things in order in their perception. Humans do not like chaos and the unknown. They have a need to understand everything - if they do not, that creates fear. Have a wonderful day Susan Deborah! People throw the above words at each other, often without even understanding the meaning of the word; it just saves them a serious, logical debate on the subject in question. Children get slotted into categories in school that are detrimental to their development. Labels that in pretty terms describe them as slow, not as intelligent as others. It's hard to fight that label later. Because English is my second language, a lot of times I have difficulty thinking of a label, so I find myself using complete sentences to describe something or someone. Until now, I thought of that as a handicap, but reading your post I see that I am lucky to forget some labels. Academics are the high priests of labeling. Always putting things into neat little packages that are convenient, but don't fit reality. Interesting topic...I struggle with 'labels' when I'm in conflict! Its when I'm in acceptance that it doesn't bother me. I once walked with tremendous shame, guilt and remorse over labeling myself an Alcoholic; it wasn't until I accepted that I am an Alcoholic that now abstains from drinking and I choose to live a life of Sobriety. I no longer feel shame, guilt or remorse because today I choose to live my life in acceptance and I no longer create the chaos in my own life as a result of denying what I am. I admit who I am today...and I am okay with who I am! Of course its taken living Sober for 9 years and 9 months to reach this level of comfort. Life is a journey...not a destination! Labels.. I think of it this way. Our mind is designed to learn from experience- survival. So when we come across something showing somewhat similar traits. We tend to put it in a familiar bucket. 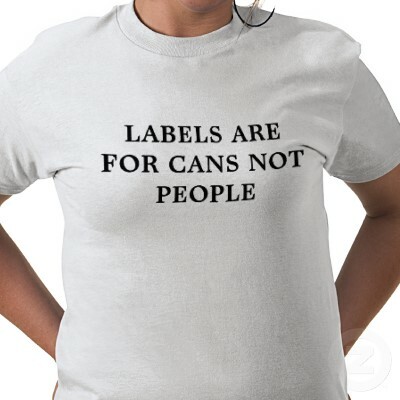 One should have labels.. and should attach them to people. But it should be like a post-it. Let it not stay for long but just to break the ice and get to know someone better. Sometimes labels can be very damaging. In my field often children get stuck with labels and a self-fulfilling prophecy takes place. For example, a child labeled as a behavior problem, autisitic, Attention Deficit, etc... often has trouble changing because people do not see the individual. They relate only to the label. Labels are convenient at times but also rather dangerous since they get 'stuck.' Sadly, I've seen that happen in staff rooms when a particular teacher labels a student and the other teachers just go by that label. On the other hand, if we someone gets a 'good' label and doesn't live up to it - there could be trouble too. Hmmm.... labels on people? Not a good idea I suppose. But on items , it is always helpful to identify the "thing"
For exampe recently we were cleaning out a kitchen at a freind's house and were really preplexed by the items kept in jars and containers with no labels. Then we had to rely on our senses, touch smell and sight. First identify, "what is it?" Then "is is old? should we throw it?" True but more often unconsciously we start labeling. Hmmmmm. I liked the T-shirt as soon as I saw it. It always sticks, Betty, no matter what. Popeye, the sailor-man! I used to like that song. Ah, Steeeve, you confuse me. I guess we are comfortable using labels. I don't like to call you so but what to do. You are an enlightened human. I'm in awe of your perceptions. BM is a fantastic human. You should read his posts. I notice it both ways. I like the word 'safe.' Wonder how words make us feel safe, Zuzana. Quite a good observation. The quote is an apt one for this post. But how do we escape that vortex? Hope you are having a lovely day, Colleen. Welcome and thanks for coming by. And . . . you are my friend as well. Of course, saving time and energy is the end. You are a blessed soul, indeed but in spite of not being a native speaker, I find that I resort to labels. Sad. Academics are that way so you are forgiven. Great to read you, Mike. Welcome to th emanderings and happy to read your insight. I'm glad that you shared your story here. Wonderful that your life has taken a turn. Joy always to you. How long is "not stay for long?" "Self-fulfilling prophecy," is a very good term. Is it a psychological term? Relating to lables is quite sad and incorrect. Good labels are always welcome but labels are labels. You have a knack of making things funny. :) Hope your trip was swell. How long..? There is no definite time period. All I say is till you no longer need a label as the person starts defining himself/herself without our need to judge or have a mental description. Well, the other day, one of my female classmates called a teacher male-chauvinist, because he calls out my name for everything during classes. His fault is that I, a male, am probably his favourite. When I told her that even I found the professor nice, she quickly put me in the same category. Now, I am confused if I realy am a male chauvinist pig. LOL! The girl is just jealous that she is not being noticed by the prof. Relax. MCP has a deeper sense and cannot be used for petty issues as the one you have mentioned. When applied to people, labels are dangerous. In the US, at least, everyone tries to be fair and not label anyone else. However, when it come to academics, I have no idea. I have been out of school for so long that I cannot say with certainty what is the norm. Academics have their own rules and labels. I somehow thought that labels were very common in the US albeit very discreetly.